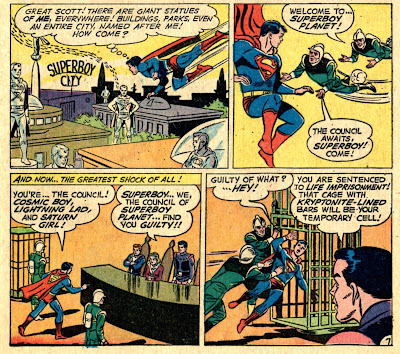 The Silver Age Superman was dramatically different from the Golden Age Superman. 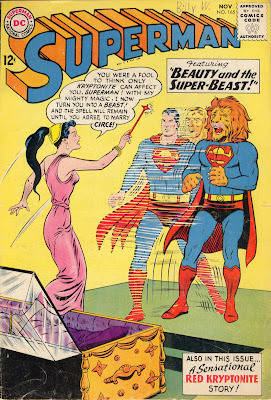 Aside from the very early stories, the Golden Age Superman tales tended to be more of a whimsical series. 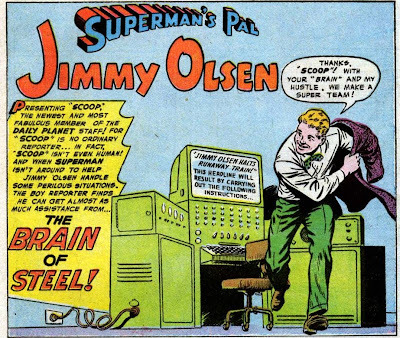 Perhaps sensing that Superman was too powerful to face ordinary crooks, the Golden Age Superman generally found himself up against conmen like J. Wilber Wolfingham, or other enemies who used guile and cunning like the Prankster or Luthor. The other option was to weaken Superman, and this DC, especially under Weissinger's editorship, began pursuing with a vengeance. 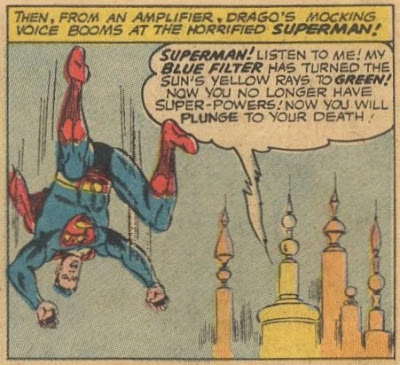 Although Green Kryptonite had been introduced in the comics as early as 1949, and in the Superman radio series years earlier than that, it had only featured in occasional stories prior to the Silver Age. 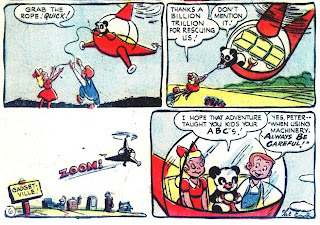 In Adventure Comics #255, Red Kryptonite made its first appearance in a Superboy story. 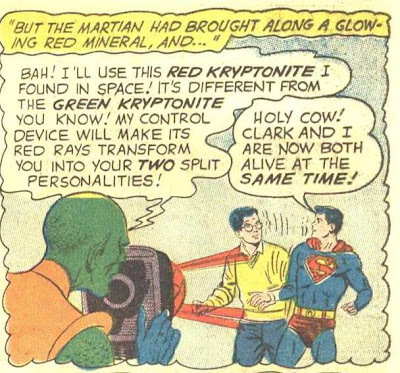 Red K had an unpredictable effect on Kryptonians, and what's more, each piece affected them differently, conveniently for plot purposes a period of exactly 24 hours. 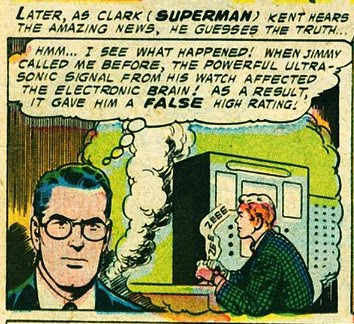 It would be quite a task to list all the changes that Red K worked on Superman over the years, but a short listing includes making him only able to speak and write Kryptonese, turning him into a dragon, causes him to lose his powers temporarily, and even split him into two people--one Superboy, one Clark Kent. DC expanded the Kryptonite line to three varieties in Superman #157. Quex-Ul, a Phantom Zone Prisoner, is released and vows to get revenge on Superman for his imprisonment. He has observed Gold K taking away the powers of a Krytonian beast permanently, and knows it will do the same to Superman. Of course, the problem with Gold K is that being permanent, DC could never use it on Superman, only threaten its use. The funny thing is that whenever the plot called for Superman to pick up the nearest mountain, they'd have him do it without blinking an eye, which just kept up the pressure to weaken him. 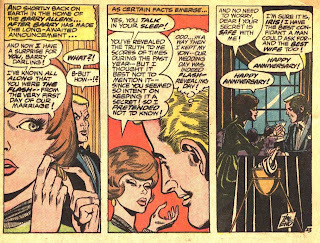 In Flash #165 (Nov 1966), Barry Allen and Iris West finally get married. 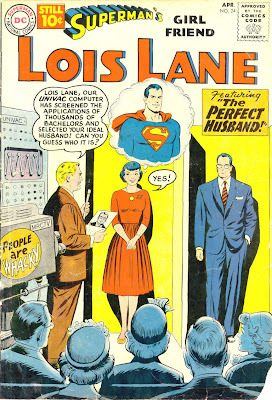 This was not DC's first wedding; Aquaman and Mera had finally tied the knot in Aquaman #18 (Nov-Dec 1964), Hawkman and Hawkgirl had been married when they arrived on Earth, and Ralph and Sue Dibney were wed immediately before the Elongated Man story in Detective #327 (May 1964). Reed Richards and Sue Storm over at Marvel had also married in Fantastic Four Annual #3 (1965). 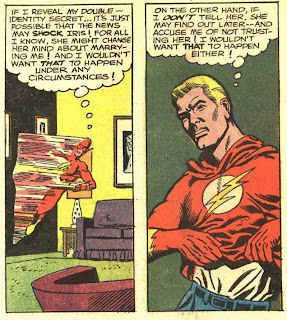 So for the next year we would periodically see Barry musing his dilemma. 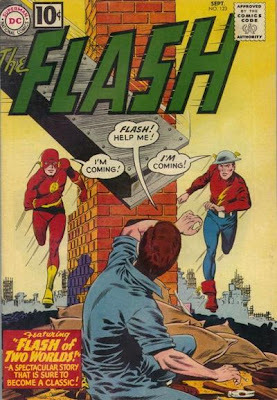 The story (as it happens) was also Carmine Infantino's swan song on the Flash, so this is an especially poignant moment. I haven't spent much time discussing funny animal-type comics on this blog so far. 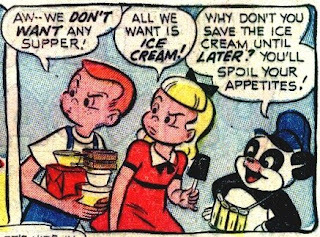 Of course, funny animal comics were not a huge segment of the Silver Age with a few notable exceptions (Donald Duck, Uncle Scrooge, Fox & Crow). 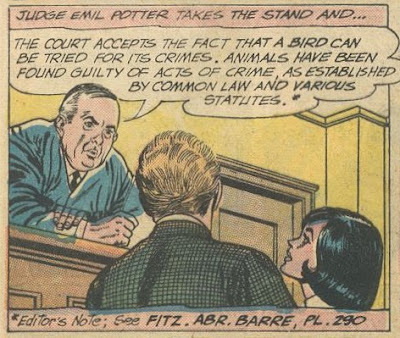 DC published only the latter during almost the entire decade of the 1960s in the funny animal genre; I don't think Marvel even had a funny animal series. But in the 1950s there were quite a few more young children around. 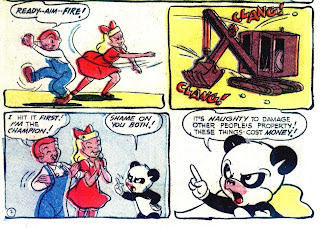 In July-August 1953, DC launched Peter Panda, an oddball series that seemed designed to appeal more to parents than to kids. Where most funny animal series involve only animals, Peter had two human friends, Jimmy and Jane. The stories mostly revolved around one or the both of the kids doing something wrong, that inevitably leads to (somewhat wacky) trouble. Fortunately, the wrong-doer quickly learns his lesson and Peter Panda arrives to save the day. What, Pandas have helicopters too? One presumes that the comic was really being marketed to mothers as a way of teaching your children lessons. 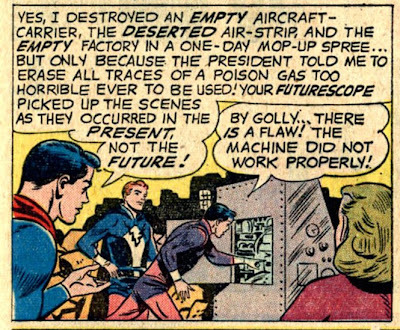 But what weird lessons--don't abuse machinery because you might get taken to Gadgetville and forced to stand trial? Don't skip dinner for ice cream because you might be forced to eat trucks full of ice cream? 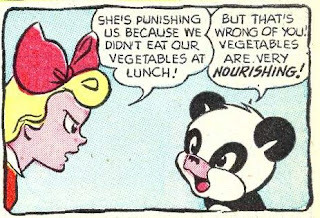 Eat your vegetables or you might get taken to the Land of the Vegetables and forced to stand trial? These poor kids were brought up on phony charges in almost every issue; wonder what lesson was being imparted there? Dial B for Blog is Back with a Real Scoop on Batman! And has an amazing series of posts about Batman's original stories that are staggering in their implications. 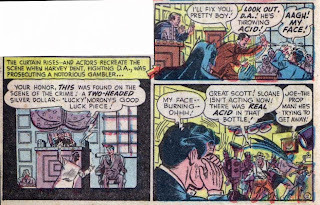 You'll have to scroll down a bit on that post to get to the meat of the allegations, but once you see the side-by-side comparisons, it becomes quite clear that Detective #27's Batman story, the first appearance of the caped crusader, was quite obviously swiped from two main sources; a Shadow pulp magazine and a Big Little Book. There are a couple of weak points, but overall the evidence is overwhelming. I'm completely flabbergasted. Also a very significant book, as we have discussed in the past. 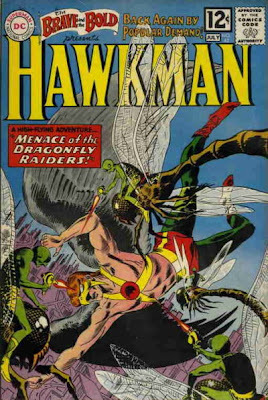 There seems to have been a push by fandom to help out DC's resurrection of this character, as Hawkman was also chosen as best hero of 1962, despite the fact that sales of his tryout issues were insufficient to launch a solo title yet. I'm as baffled as you probably are by that one. The New Look Batman picks up a win for Carmine Infantino. An effort at reviving two Golden Age heroes. Although both this issue and Brave & Bold #62 were terrific, they did not sell enough to justify continuation. Al Williamson's take on the comic strip classic. 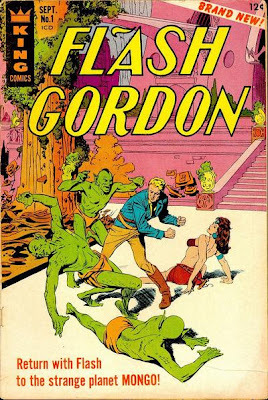 Various efforts were made to bring Flash Gordon to the comic books, but none ever succeeded. 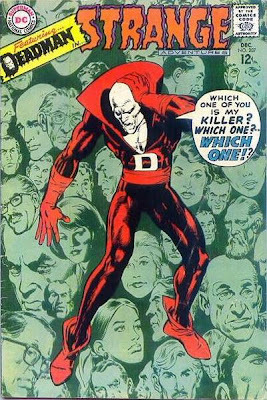 Most of the major publishers tried at least once--DC, Harvey, Marvel, Dell, Gold Key and King (which produced this attempt). 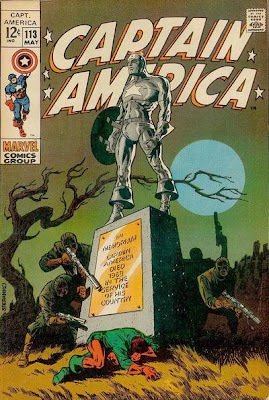 Neal Adams picks up the first of many awards. Note that this is the only cover chosen in the decade that has word balloons. Update: DOH! As pointed out by Snard in the comments, the Flash #123 cover also has word balloons. 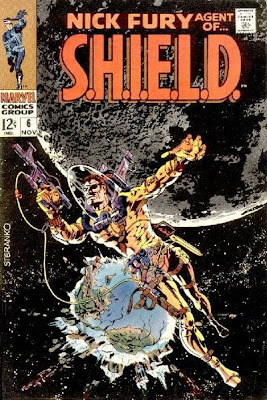 Jim Steranko checks in with a memorable Nick Fury cover. Steranko wins for the second consecutive year. This is a topic I will be returning to over time to add details. 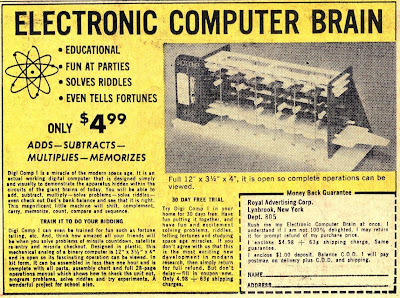 Comic books were always interested in cutting-edge technology, and computers were certainly considered in that category back in the 1960s. As I have discussed previously, DC in the Silver Age elevated science to the status of a religion, with Jor-El as the high priest. But curiously, when it came to the fruits of that science--technology--DC was decidedly more ambivalent. We have discussed in the past the Kryptonian machine that determined what occupation you were best suited for and to which you would be assigned with no appeal. And we've covered the machine 500 years in the future which determines whether you have sufficiently repented criminality before your parole date. And what do both those incredibly sophisticated pieces of technology have in common? They both screwed up! But as Superman he's compelled to help make Jimmy look like Napoleon to convince some foreign spies that they should not invade against this fearsome young general. 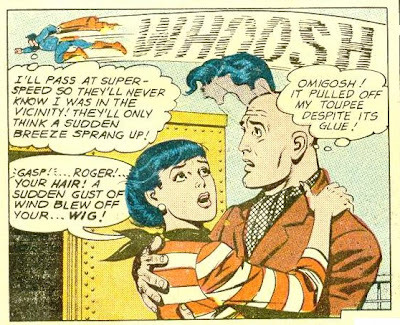 Roger is so embarrassed at his lack of hair that he is unable to face Lois again, so we are left wondering if she could have overcome her irrational prejudice towards the follically challenged. And whether the computer worked or not in this case. Discussion of the Digi Comp I here. In JLA #37-38, DC brought back the JSA for the third teamup with the Justice League. Once again, they continued to rotate the characters. 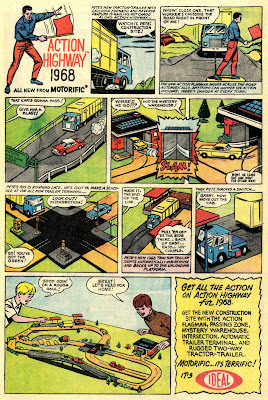 In this story, Johnny Thunder and his Thunderbolt appeared for the first time since the 1940s. 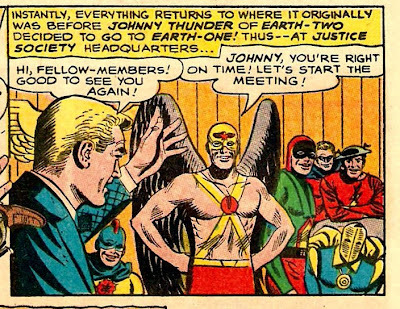 Johnny is probably the least famous JSA member. He effectively had a genie (the Thunderbolt) who would appear whenever he spoke the words "Say you". The humor arose because Johnny apparently didn't know those were the magic words, although of course he managed to say them by accident many times. He was a major DC character of the 1940s, appearing in many issues of Flash Comics (including #1) and All-Star (including as a charter member of the JSA in #3), as well as the first three issues of World's Best/World's Finest and World's Fair Comics 1940. Fate was not very kind to Johnny. In Flash Comics #86, a backup character was introduced named the Black Canary. 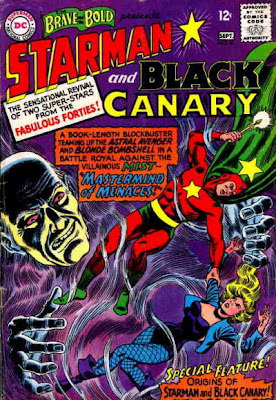 Six issues later, Thunder was out and the Canary was in; she also fairly quickly eased him from of his role in the Justice Society. In this story, Johnny does know the words "Say you". He has been invited to a meeting of the JSA once again. However, upon learning that there are Earth-1 counterparts to some of his old mates, he becomes curious as to what his doppelganger is like. 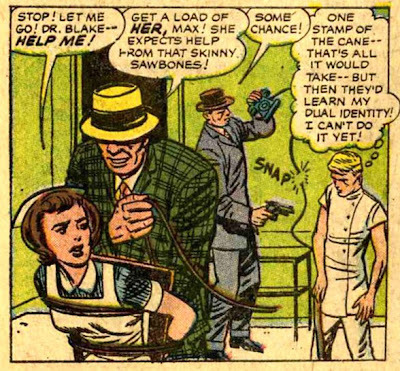 It turns out that the Johnny Thunder of Earth-1 is a small-time crook who remembers reading the old Johnny Thunder comics in the 1940s. He kayos Earth-2's Johnny and takes over control of the Thunderbolt. Since Johnny has not shown up for the JSA reunion, his old mates are worried. They track him down to Earth-1 where they are stunned to learn that the JLA does not exist. They battle Johnny and his Thunderbolt, but are unable to prevent them from getting away with magic. 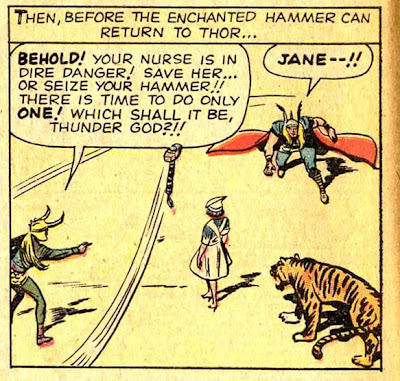 They discover from interviewing Thunder's henchmen that there are no superheroes on Earth-1 and never have been. So they decide to mimic the JLA themselves, using their powers to fake the Earth-1 heroes' abilities. 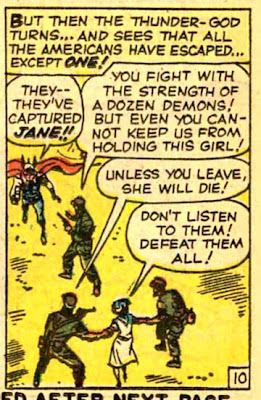 They trounce Johnny and the Thunderbolt, but the former soon figures out that it was the JSA members in disguise. In response, he tells the Thunderbolt to arrange for it that five of his cronies become the JLA heroes Batman, Superman, Flash, Green Lantern and Martian Manhunter. Thus his criminal henchmen become supervillians, setting the stage for a battle in the following issue. Johnny escapes to the moon where he forces the Thunderbolt to create three new villains, but in the end they are defeated, and so it's a battle of the T-Bolt and Dr Fate. But Johnny gets caught up in the fight and is being battered, so he finally wishes that none of this had ever happened. I've always liked this particular issue, for several reasons. 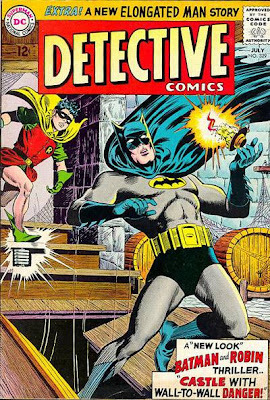 First, it features Batwoman and Robin working together. Why? Well, because Bruce Wayne is in prison! It's something of a stock DC plot, with Bruce agreeing to be found guilty of being the fantastic new criminal, The Collector, in an attempt to befriend a prisoner who has somehow found blueprints to the jail. 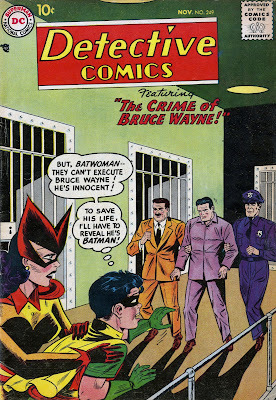 As in all such stories, though, only one person (Commissioner Gordon) knows that Bruce is not really guilty. So when one of the convicts attempting a breakout with the plans accidentally kills himself, Bruce is accused of murder and sentenced to die. And of course, the Gotham legal system makes Texas look deliberate, so that Bruce is convicted and receives the last meal rapidly. Can Batwoman and Robin save him? 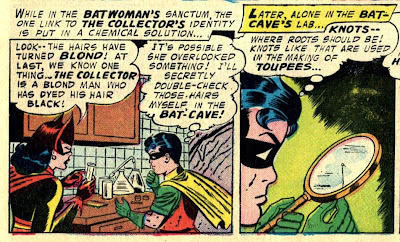 This is contrary to the usual Silver Age stories in which Robin is almost always second banana to the World's Greatest Detective. Eventually Batwoman and Robin capture the Collector and the warden gets the governor to call off the execution. 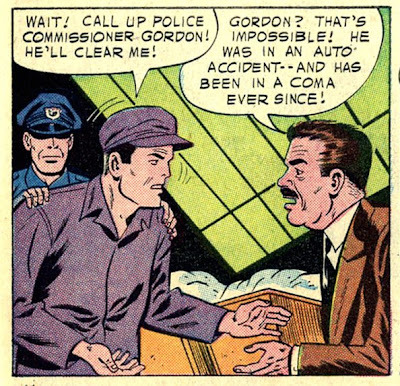 We never do hear that Commissioner Gordon has recovered from that nasty coma. The story is unique in that Batman only appears in one panel; it's almost all Bruce Wayne. 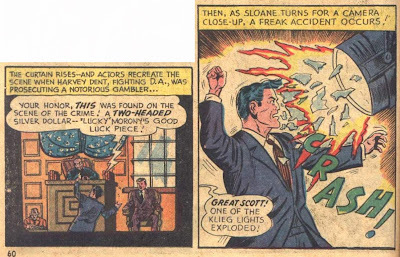 The second story is The Ghost that Haunted Roy Raymond. The Roy Raymond stories were amusing little tales of a TV debunker of the supernatural. In this one, Roy proves that the ghost haunting him is actually a fake arranged by a couple of men trying to settle a bet. Yes, thank goodness those wily promoters are not allowed to make a profit on that wheat! In the Martian Manhunter story, the governor is being threatened by gangsters trying to get a pardon for one of their members who is scheduled for execution. Two death penalty stories in one issue! Detective Jones impersonates the governor using his special power of being able to mimic any form (pretending he used makeup for the trick). The execution apparently goes forward, and the next day the crooks try to get revenge on the governor, but Jones manages to defeat them without revealing he's a Martian. 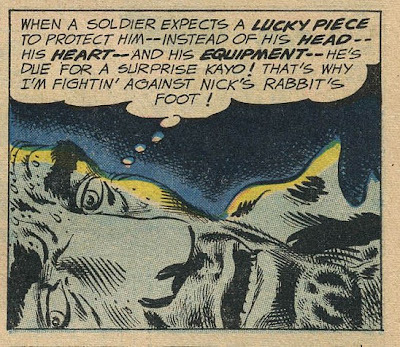 In 1963, Marvel really got hopping. For September of that year, they turned out not one, but two new superhero teams. The first, The Avengers, was made up of the heroes they had launched to that point, including Iron Man, Thor, Ant-Man, and the Hulk. The second group, therefore, had to be newly created. Rather than give them separate origins, Stan and Jack came up with a new concept for superheroes: They had all been born that way. They were mutants, members of "homo superior", as compared to homo sapiens. The Flyboy is The Angel, originally Warren Worthington III. Although this issue does not reveal much more about him than that he can fly and wears a harness while in street clothes that hides his wings, the name is clearly intended to give us an image of a wealthy young preppie. The big-footed gentleman on the trapeze is The Beast, real name Hank McCoy. He's something of a monkey-boy, capable of bouncing around at will and using his feet almost like hands. He's also a sesquipedalian, somebody who never uses a simple word when a six-syllable term will suffice. The laser guy is Cyclops, introduced in this issue as "Slim" Summers although later stories use his given name of Scott. Although it is not apparent in the first issue, Summers is the leader of the team when away from their home base. The gal in the background looking like she's riding a surfboard is Jean Grey, alias Marvel Girl. Her power is here described as "teleportation" although in fact it is more telekenesis as later stories will acknowledge. Jean is the source of some of the friction in the group, as everybody (except one) is attracted to her. 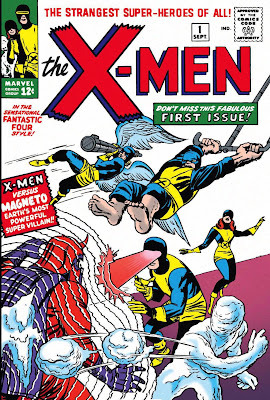 The lone holdout from the Jean Grey admiration society (at least in this first issue) is Iceman, shown throwing snowballs above. Bobby Drake is the youngest of the X-Men at only 16. The villain is Magneto, certainly one of the most durable villains of the Marvel Silver Age. He too is a mutant, but an evil mutant determined to take over the Earth as its ruler. Not shown is the regular leader of the X-Men, Professor Xavier. Although confined to a wheelchair, he possesses a superior mind, capable of telepathy at great distances. The X-Men were destined to become one of the great teams in comic book history, although that may not have been obvious at first. 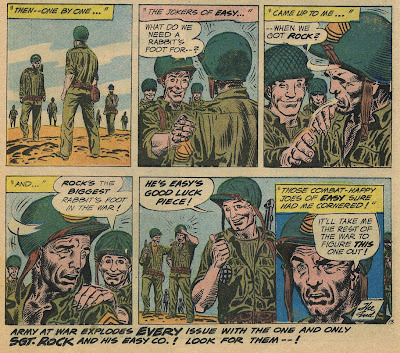 In fact, they did not survive to the end of the Silver Age, being cancelled after issue #66, March 1970. But they would return in the mid-70s with different members and become extremely popular. This is another post, like my Batman and Guns post, that will be regularly updated as I come across interesting stuff to add to it. 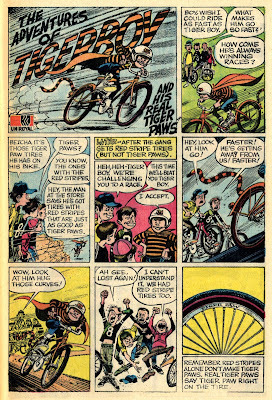 To most of us comic readers, the ads were generally an annoyance, since it meant one less page of story and art. But some of the ads were well-designed or featured genuinely interesting products, and I am going to comment on those. This accessory will stop a vehicle, and allow a flagman to 'cross' in front, then allow the vehicle to proceed. Ingeniously done with a hidden turntable and magnets. The extra fun of the item comes from its own inherent lack of precision: Occasionally the vehicle runs over the obnoxious flagman. 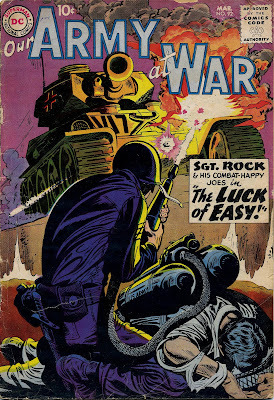 I believe the art on that is by the famed EC artist, Jack Davis. An aside here: Bicycle tires can matter. I was out riding one time with a couple friend who were much better riders than I. But we started riding up this muddy hill and I passed them with ease. As I did, one of the other riders exclaimed "Holy smoke! Look at all that mud coming off that tire!" As it happened, I had a Mud Dawg tire on the back, and it was indeed shedding mud like water off a duck's back. A ration of Grog for the kiddies? Here's one of the odder products advertised. A dinosaur that grows its own tail, that you can then plant and watch grow into a beautiful shade tree? And it grows another and another? My folks mounted Grog on an upright support of our backyard patio and I filled his teensy tail-hole with soil and planted the seed. I waited. And waited. And waited some more. Maybe I hadn't been watering Grog's tail enough; after all, didn't "succulent" plants need lots of water? So, instead of the eyedropper I was using, I used a small paper cup to water the plant. It immediately overflowed the miniscule receptacle, washing all the soil and seed right out of Grog's tail-indentation! I never did find that seed (it never grew out of the backyard lawn, that's for sure) and Grog soon became another of those items buried in the garage, never to be seen again. 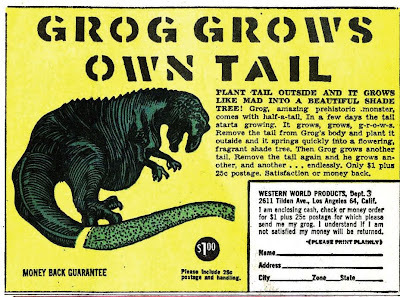 Grog was a disaster and a rip-off, but he taught me about mail-order toys from comics, and probably discouraged me from throwing away good comic-buying allowance for such things as those "giant dinosaur balloons" and other such junk available in comic book ads. Knockoffs of the Flash, Wonder Woman, Batman, Green Lantern and Superman respectively, but with one crucial difference. They are evil, and form the Crime Syndicate of America. In fact, on their world there are no superheroes, making it a pretty grim place indeed. Note as well that this time DC embraces the concept of alternative versions of their flagship characters, Batman and Superman, although they still had yet to do so on Earth-2. The Crime Syndicate members have been successful in their theft attempts so often, that they are getting careless. And when they learn that there are other Earths vibrating at a different speed from theirs, with superheroes to test their mettle, they decide it will be good training to face the heroes of Earth-1. By no small coincidence, the JLA members available to face the Crime Syndicate their counterparts listed above, and at first it looks like we'll see straight matchups, but as it turns out, the villains have switched positions for the most part, so it's mixed matches, with the Flash facing Ultraman, Batman against Johnny Quick, Superman against Power Ring, and Green Lantern against Owlman. Not surprisingly, Wonder Woman and Superwoman did get to face each other, since it prevented two man against woman fights. After being transported to Earth-3, the superheroes find that the villains have a home field advantage, and they are quickly subdued. 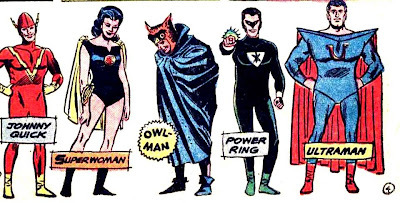 Improbably, the villains, rather than doing the obvious (killing the Justice League members), decide to be sporting and find another earth to host the rubber match. Earth-2 is the obvious pick and so the Crime Syndicate studies it. But this alerts the JSA, who discover the JLA held captive around their conference table. Doctor Fate is able to disrupt the spell holding them with the lightning bolt shown on the cover long enough to learn of the impending invasion from Earth-3. 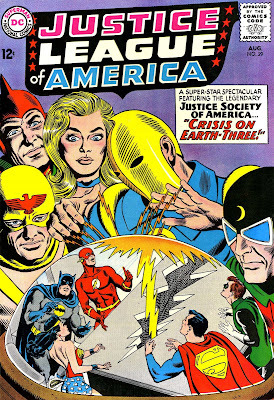 Gardner Fox rotated the JSA members for this issue. 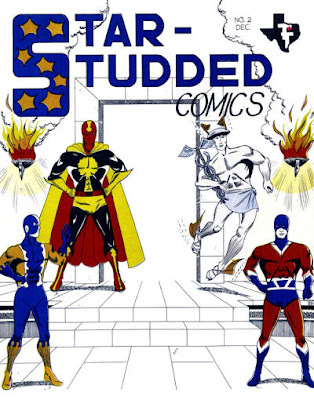 Making their first appearances in the Silver Age were Starman and Doctor Midnight, while Hawkman, Black Canary and Doctor Fate returned. Black Canary's continued presence highlights that DC was still uncomfortable with the idea of a GA and SA Wonder Woman. This sets up the rematch of the JLA versus the Crime Syndicate, and this time the JLA wins. They learn that the villains have set a trap if they free the JSA members, and so disable the trap before saving their friends and sealing the Crime Syndicate in a bubble.